At 2:10 p.m., silver prices today were down 0.05% and trading at $14.66. The precious metal is coming off an extremely volatile month, hitting a 2015 low of $14.11 on Aug. 26. Silver prices saw an overall loss of 1.4% in August. The volatility in silver prices last month was caused by historic sell-offs in stock markets around the world. The Dow Jones Industrial Average cratered 6.6% in August. The index saw the largest one-day plunge in its history on Aug. 24, which the media referred to as "Black Monday." China's Shanghai Index dropped 12.5% in August, marking its worst monthly performance in more than three years. 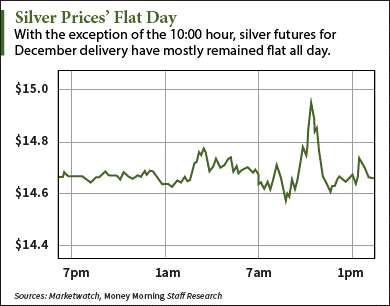 The flat movement in silver prices continues to mirror the broader market. The Dow Jones saw a slight loss of 0.07% this afternoon. Today's quiescence can be attributed to China, whose markets are closed on Thursday and Friday this week. Many investors have been wondering why China's stock market is closed today. Some have even mistaken it as a strategy for calming the chaos that has plagued the second-largest economy since mid-June.